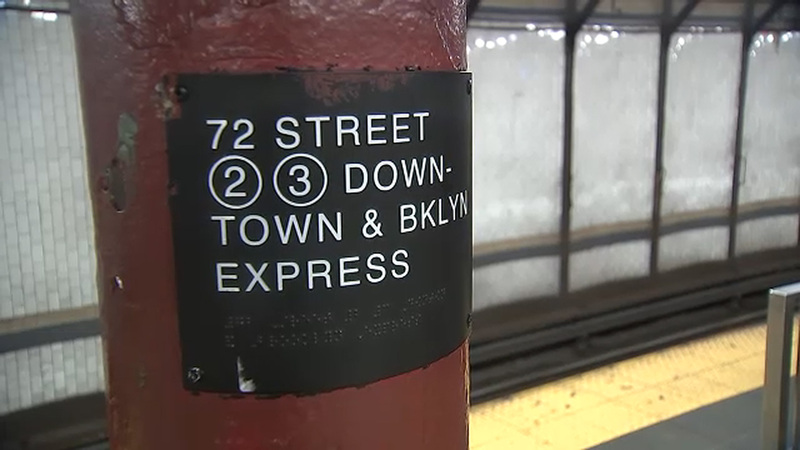 UPPER WEST SIDE, Manhattan (WABC) -- An 8-month-old baby is hospitalized after her stroller rolled onto the subway tracks in Manhattan Thursday morning. It happened just after 9 a.m. at the 72nd Street station on the Upper West Side. Authorities say the operator of a northbound 2 train on the express track spotted the stroller rolling onto the local track and alerted the Rail Control Center, which notified police and cautioned other trains. The train operator saw two customers immediately jump onto roadbed, with one retrieving what looked like a car seat with the baby in it and the other what looked like the stroller base. Both climbed back onto platform immediately. The platform was not crowded, and no trains were in the area at the time. "We're so glad this incident was resolved quickly with apparently no serious injury and are proud of our front line employees, from an eagle-eyed train operator to the attentive team at the Rail Control Center, who did a great job in reporting and acting on this immediately," NYC Transit President Andy Byford said. Erin Turingan, an ambulatory pharmacy manager, tells Eyewitness News she was headed to work and was standing on the uptown 1 train platform when she saw the stroller rolling and the father barely miss catching it by an inch. "He screamed, and his older son started crying immediately," she said. "The father jumped into the tracks, and I went to the older son to comfort him briefly. And when the father got the baby out of the stroller, he yelled, 'Can you help me up?' and I grabbed his hand to pull him out." She said she then called 911, and by that time, other people came and the second man went into the tracks to get the stroller and other belongings that fell. She said she and another woman helped the father and children bring the stroller into the elevator to go up to meet EMS, and once she saw that family was safe, she continued to work. "Our train operators have to be alert for anything out of the ordinary along the tracks, and this operator was definitely at the top of his game this morning, thank God. He very well may have save this little girl's life, and the Transport Workers Union Local 100 couldn't be prouder to call him a member."